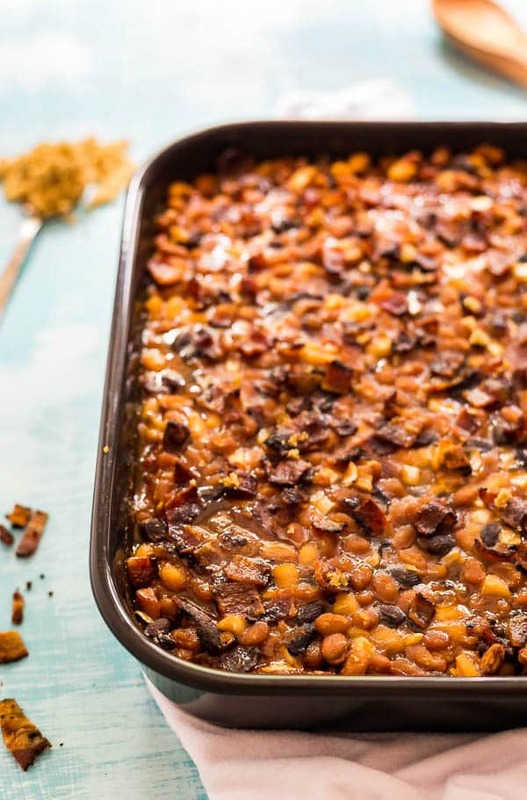 This recipe for the Most Delicious Baked Beans is the best quick and easy recipe for a crowd! 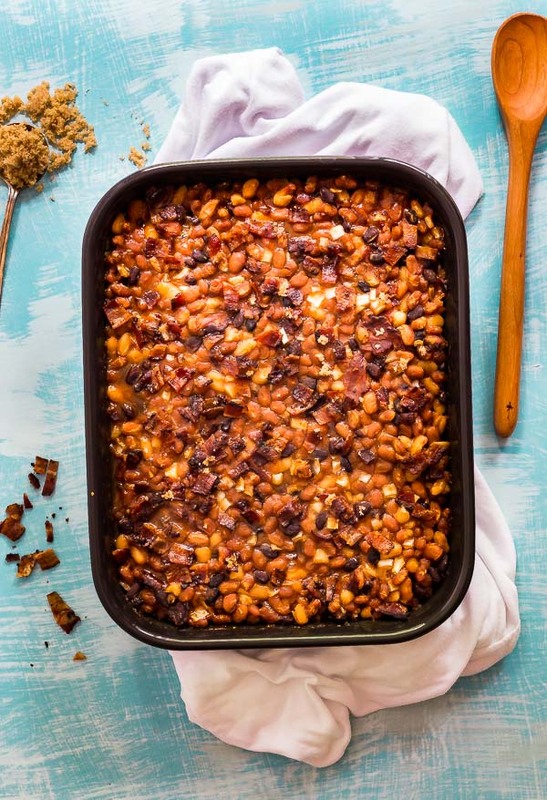 Made with brown sugar, bacon and tons of different varieties of beans, they bake up perfectly in the oven and no one will be able to resist going in for seconds! This past weekend not only flew by, but I kind of felt like I didn’t get a moment to rest and breathe. It was a great weekend but I’m exhausted. On Friday night, J went to a new local casino with some friends. So I grabbed the girls and we had dinner at my mom’s (my dad also happened to be at the casino that night). It was very interesting to watch A eat that night. We pan-seared some of the most fantastic Sockeye Salmon- it was sweet and delicious with the great flavor that you can only find in wild-caught salmon. We also had some simple green beans and some rice. It was interesting because she’s in the toddler phase that they all go through where they suddenly “don’t like” things that they had previously loved (like Salmon and…you know…alllll the things!). If you’re a longtime reader of this blog, you already know that I’m no stranger to picky eaters. J is one of the pickiest eaters I know. And A really isn’t that picky, at least not compared to most of the toddlers I’ve been around. It’s more just her trying to assert her independence and power. I don’t make a huge deal out of it, since I refuse to have a power struggle and she always at least tries everything (ahhhh, the power of the no-thank-you-bite!). But under normal circumstances, when I make fish there’s usually also a different protein also available for Mister-Picky. I know this is a total double standard since I never, ever cook different meals for my girls, so why would I ever do it for him? And those also happen to be the nights that A gets extra weird about fish. Coincidence? I’m starting to think it’s not. Especially since she ate it with very little to say on Friday night when there were no alternatives available. While she didn’t have the same unbridled enthusiasm as her sister, she definitely ate well beyond the requisite no-thank-you-bite. So it seems obvious that I need to reevaluate my strategy. It can be so easy to fall into a pattern of foods and J and I both recognize the importance of consistently introducing the girls to a variety of different foods. I’d like to start cooking at least one “weird” or more accurately, different dish per week. I’ll let you guys know how it goes. 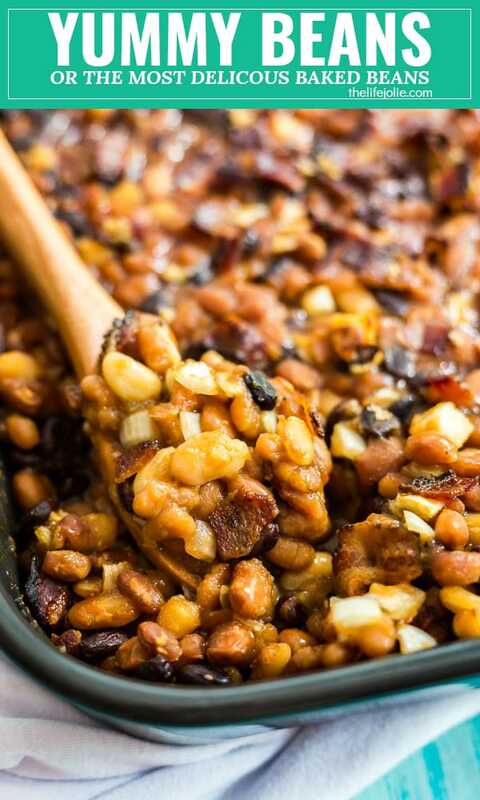 In our circle, these beans have always been referred to as Yummy Beans. Which makes sense, because yummy is probably the best word to describe them! Originally shared with is by our across-the-street neighbor, Wendy, these were an instant hit and quickly became a stand by at every back yard BBQ. On a side note, as kids we could always count on Wendy to share an endless supply of Pixy Stix to fuel our summertime sugar highs! 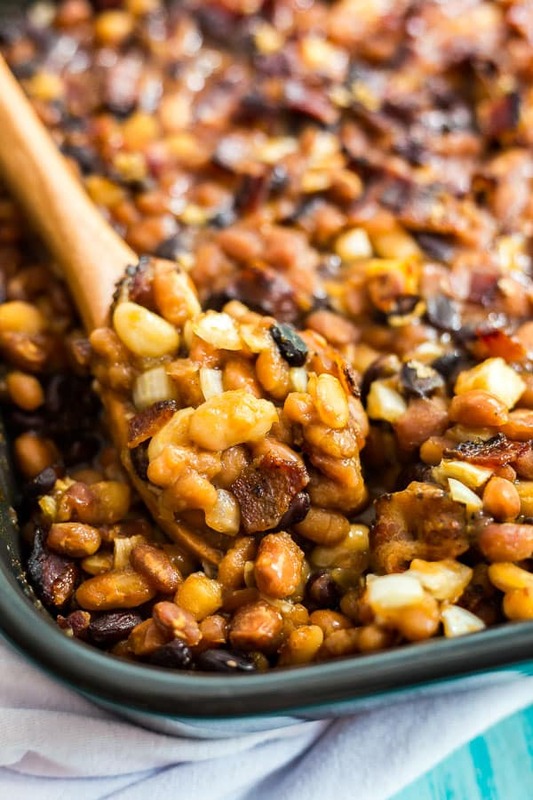 They have the sweetness of the brown sugar, the savory smokiness of the bacon (I reserved some to top it with as well so that you’d get some bacon in every bite) and a few different varieties of beans. And even better they require minimal work up front. Just fry up some bacon, open a few cans, mix it all together and pop it in the oven. It makes a pretty huge amount, so this is a great go-too for a group gathering (they will want seconds!). You can always half the recipe if you’re cooking for a smaller crowd. 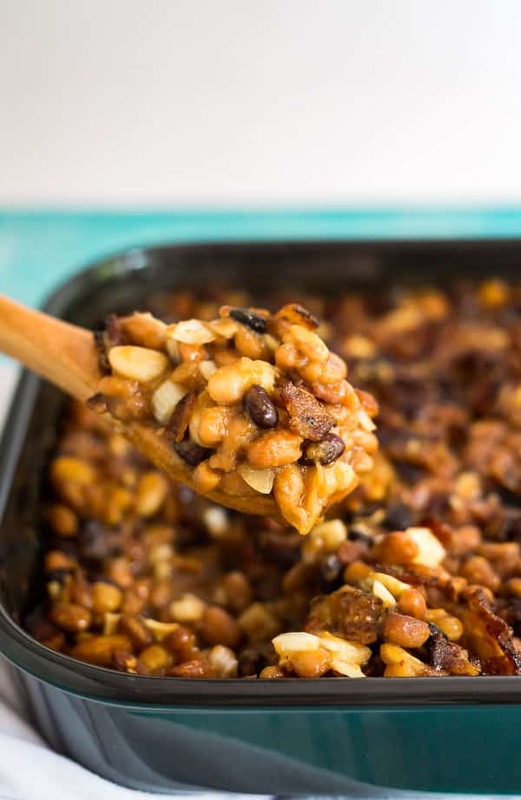 The recipe also calls for ground beef, which I personally omit when using this as a side dish, but if you’re looking to make a meal of this, the ground beef really is the perfect addition! Mix all ingredients (except for the reserved 3 slices of bacon) until well combined. 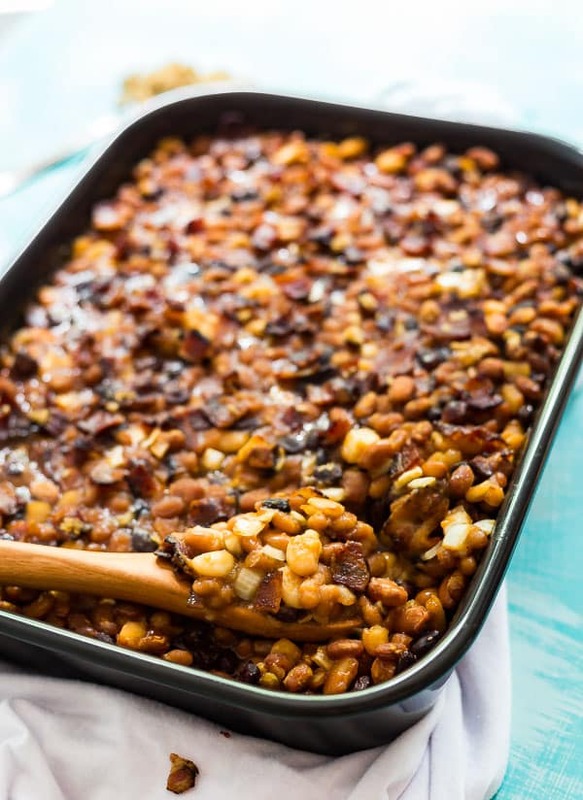 Pour it into a large baking dish and sprinkle a bit of brown sugar and the remaining 3 slices of crumbled bacon on top.